Should your software or hardware sales reps cold call? You are here: Home / Corporate Strategy / Should Your Sales Reps Cold Call? Should Your Sales Reps Cold Call? In this article we’ll take a look at arguments on both sides of this issue and recommend when — and how much — cold-calling makes sense. This is an age-old question in sales. Some would say that’s what sales people should be doing. Others believe that if sales reps have to cold call, it’s an indication of poor marketing and is very inefficient. I often refer to cold-calling as DOOR-TO-DOOR marketing, because you’re really combining the introductory marketing and sales functions in one phone call or visit. The important question: is this a good or bad thing? This is a crucial factor when deciding whether or not to include a lot of cold-calling in your sales mix. If target prospects are easily identifiable, it makes much more sense to start contacting them sooner rather than later, as opposed to if your reps have to google or dial for hours to find an appropriate prospect. It’s very difficult to cold-call prospects when you are selling technology products or services which are very new, or difficult for the prospect to grasp quickly. Prospects are all very busy trying to do their own jobs, are overwhelmed with offers via every media and contact method and tend to tune out cold approaches that aren’t of immediate, obvious use to them. In such cases, using outbound and inbound marketing methods to educate and identify prospects first tends to work a lot better than a cold sales call. On the other end of the spectrum, for commodity items that people know they need, a timely cold call can lead to an immediate sale that a competitor might have otherwise gotten. How to divide your investments between marketing and sales is often driven by the relative costs of each. How effective are your outbound and inbound marketing programs? If your marketing cost-per-lead is very high and the close rate isn’t great, in some cases it might make sense to skip the lead gathering altogether and get right to the sales call. I caution that this usually isn’t the case–but it’s possible. Also, whether this makes sense also depends on many other factors such as those discussed elsewhere in this article, notably the ease of prospect identification. This factor is most relevant with respect to cold-calling for tiny niche markets. For example, what if you have a software product with a multi-million dollar price tag — aimed at 100 or less total prospects? In this case, it doesn’t make sense to put much money into outbound or inbound marketing programs if these prospects are easily identifiable. While it’s still important to have available marketing proof points such as case studies and white papers, it’s probably time to call them up or pay them a visit, as soon as possible! If it’s the end of the day (literally or figuratively) and all the leads have been followed up on, it’s DEFINITELY time to cold-call. Every sales organization or individual rep should have a game plan on how to prospect on their own, when all the warm leads have been exhausted. It’s either that or it’s time to head to the golf course (which happens too often – at least figuratively – and tends to give the sales force a bad name, as well as not raising sales much!). In general, sales forces are costly. If you have a product with low revenue per sale, it’s suicidal to rely strictly on cold-calling. Unless your reps are working on a commission-only basis (not recommend in most cases, for reasons outlined in other articles I’ve written), it’s a prescription for a low or even negative margin sale. Low-priced sales absolutely require an efficient marketing engine to generate a large amount of low cost leads 0r even turnkey orders, which lead to easy sales. With a big ticket product, the economics work better and more frequently allow a sales-intensive approach. Commodity products are a less straightforward category; in some cases a sales-driven approach might be best and marketing-driven is preferred in other situations–it’s dependent on the details. So what’s my summary view of cold-calling? It’s hard to generalize, as I’ve outlined with some of the factors discussed above. But I believe that there is a place for it in the overall sales plan. I also believe, however, that in most cases if reps are doing 100% cold-calling–or even the majority of their time–then the company is operating at far less than peak efficiency. A 100% cold-calling sales force is usually indicative of an institutional lack of marketing expertise. This usually means less revenue and profits generated for the company than there would be with a more balanced sales/marketing approach. Balanced, integrated sales and marketing is what works best in the great majority of situations. With respect to individual reps, if they are forced to cold-call often, you’re probably under-utilizing them. But if a particular rep is reluctant or completely unwilling to cold-call when the situation demands it, you may have a rep you should consider replacing. There are always exceptions to such generalizations for specific companies and market, but with cold-calling I believe they are few and far between. 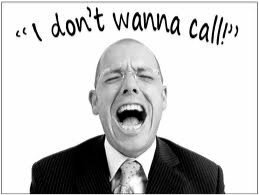 I’ve outlined some ideas about when, where and how much cold-calling is appropriate in sales. This is a topic that is much debated–what’s been your experience? Post a comment below so we can have the benefit of your view.